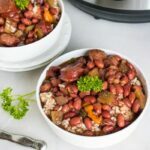 This Instant Pot Red Beans and Rice with sausage recipe is the perfect weeknight dinner that is hearty and so delicious. It’s such an easy dinner recipe that everyone will love. 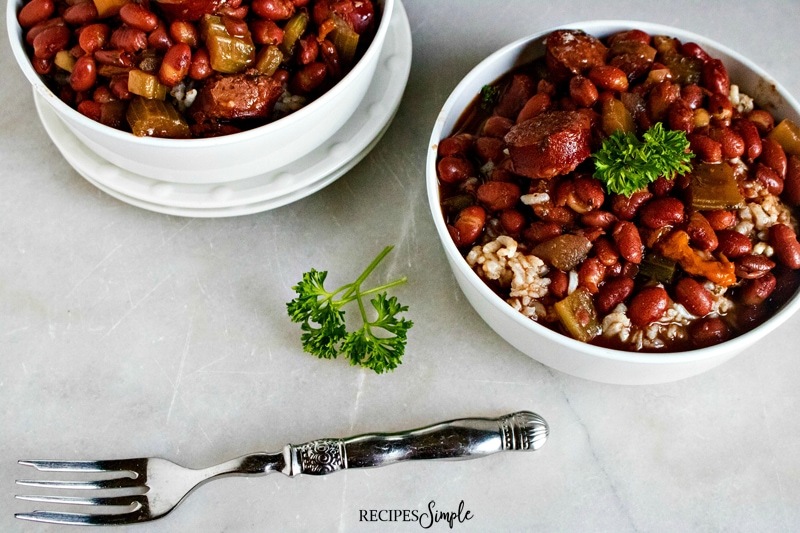 Red Beans and Rice is a delicious traditional Louisiana dish. 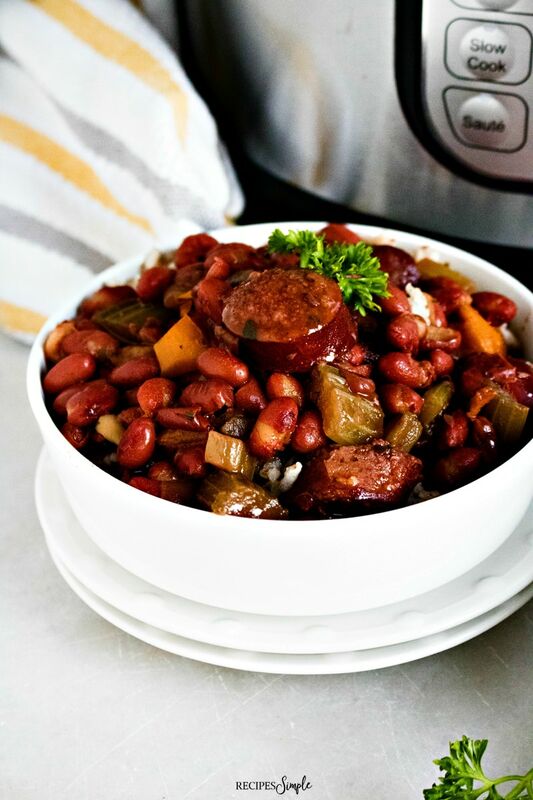 This Red Beans and Rice with Sausage recipe really hits the spot and we serve it year-round. We like to serve it with cornbread, French bread or hot buttered rolls. If you haven’t jumped on the Instant Pot bandwagon, you really need to. I don’t know what I would do without my Instant Pot and my Slow Cooker! 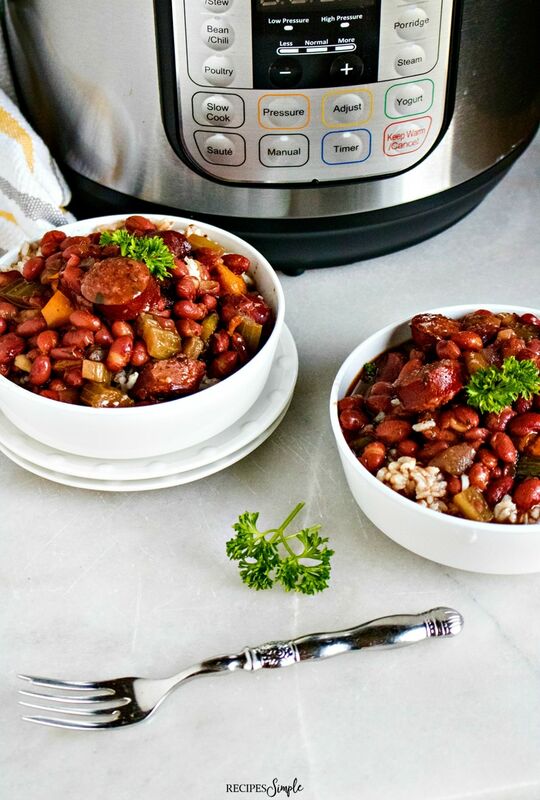 Pressure cooking really makes cooking dinner so easy. The Instant Pot and Slow Cooker and the two most used appliances in my kitchen. They make getting dinner on the table quick and easy. 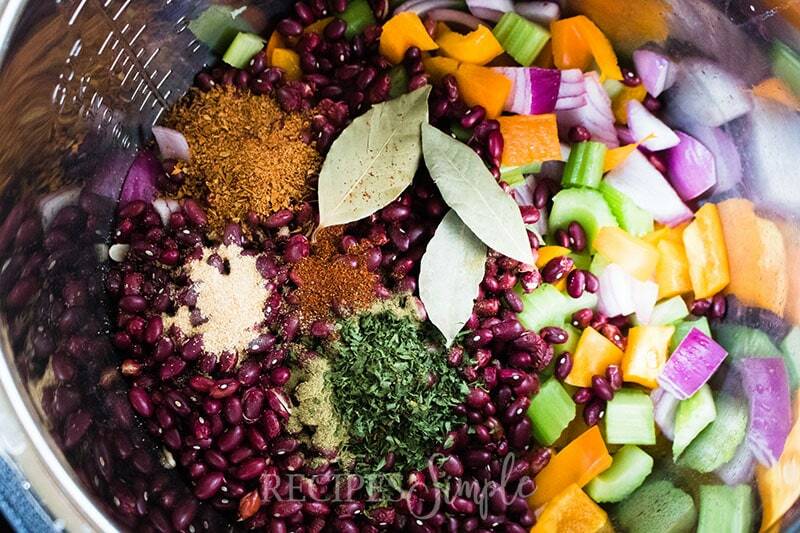 If you’re looking for a delicious homemade Red Beans and Rice recipe, you will love this one! It has lots of flavor and is the perfect Creole comfort food. 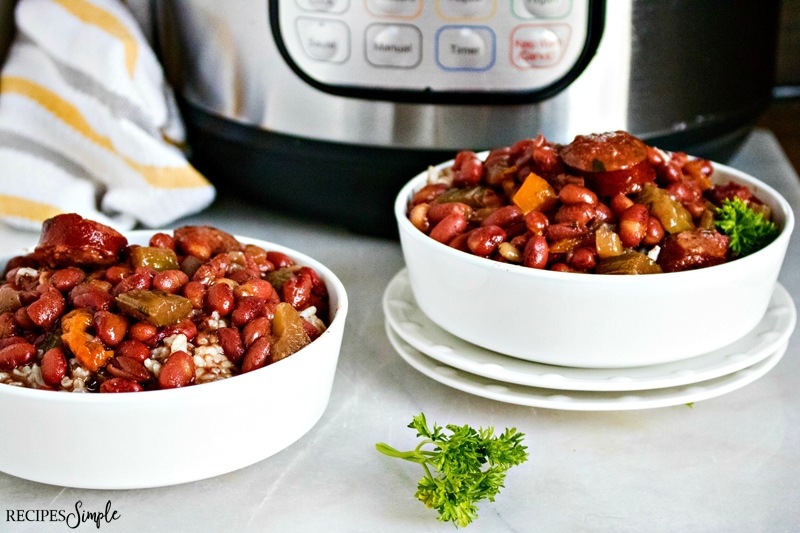 One of the perks of cooking this in the Instant Pot is there is no need to presoak the beans. 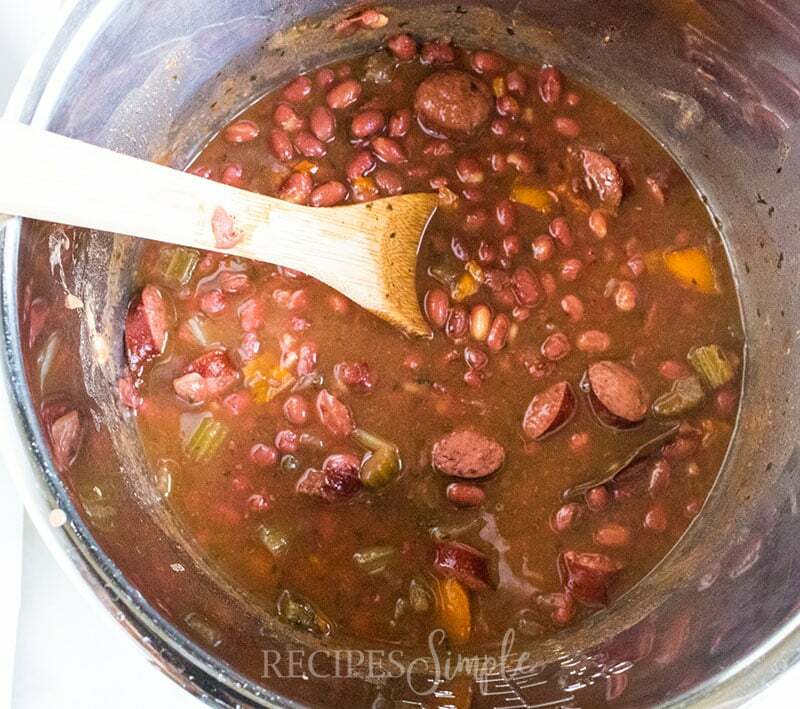 Scroll to the bottom for the printable simple red beans and rice recipe! Before you get started, gather all your ingredients. You’re going to need olive oil, red onion, orange bell pepper, celery, red beans, garlic, bay leaves, cayenne pepper, thyme, parsley, Canjun seasoning, chicken broth, water, and kielbasa sausage. 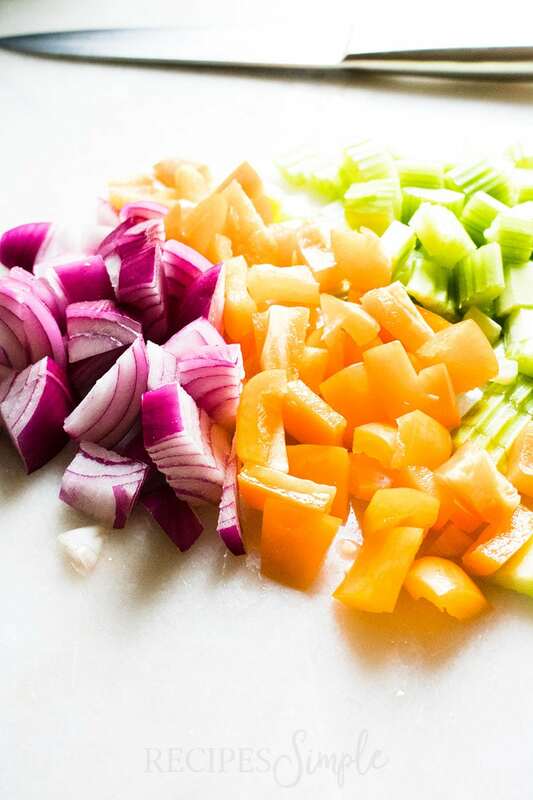 Once you have your ingredients ready, turn on the instant to sauté mode and add the oil, onion, pepper, and celery. Cook for 2-3 minutes and then turn off the sauté mode. 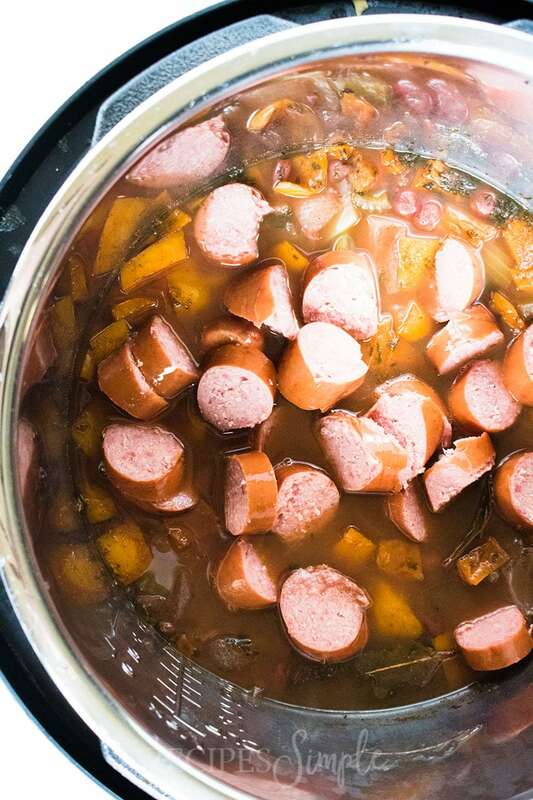 Add the remaining ingredients, except for the kielbasa and then close the lid and turn the pressure valve to sealing and set manual pressure on high for 30 minutes. Quick release the instant pot once done cooking and then add kielbasa before setting the valve back to sealing and cooking for another 15 minutes with it on the manual pressure setting turned on high. Once it’s done cooking, allow it to completely natural pressure release for approximately 20-25 minutes. Serve over a bowl hot rice and enjoy! 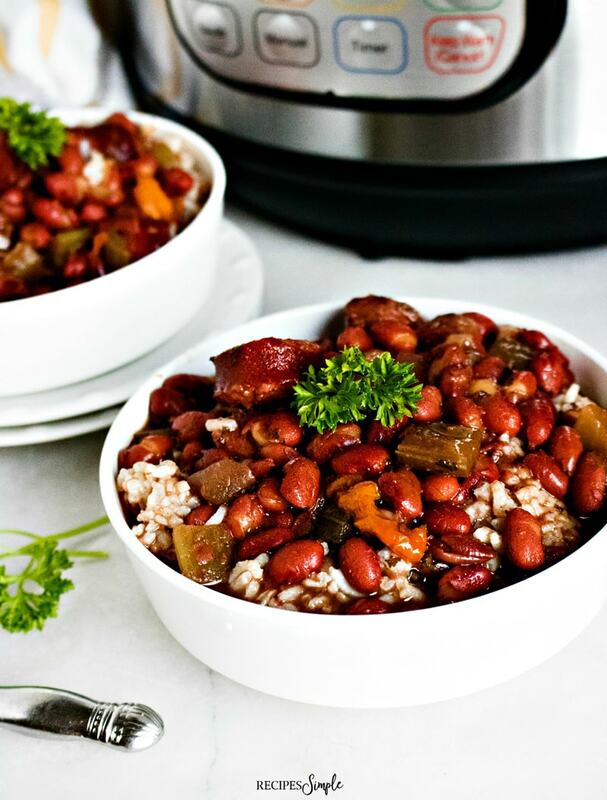 This instant pot beans and rice recipe is the perfect weeknight dinner that is hearty and so delicious. It’s such an easy dinner recipe that everyone will love. 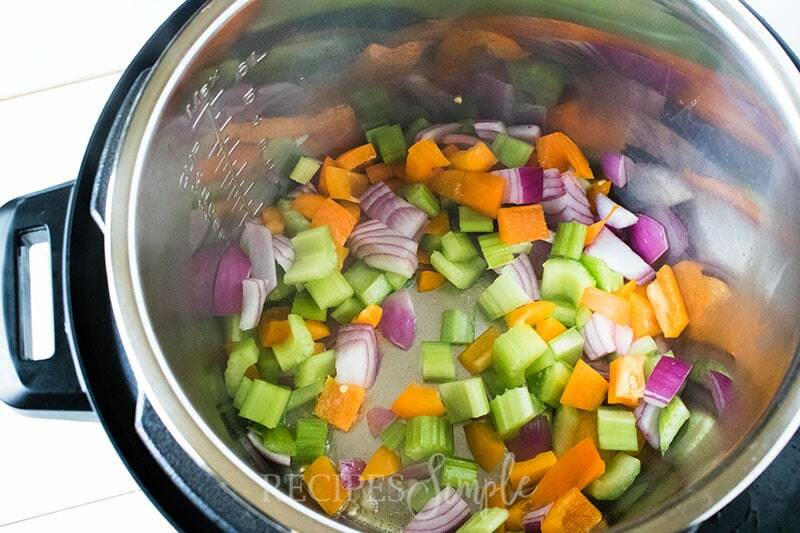 Turn the instant pot to sauté mode and add the oil, onion, pepper, and celery. Cook for 2-3 minutes and then turn off the sauté mode. Quick release the instant pot once done cooking and then add kielbasa before setting the valve back to ealing and cooking for another 15 minutes with it on the manual pressure setting turned on high. Once it's done cooking, allow it to completely natural pressure release for approximately 20-25 minutes. Instant Pot Chicken Pad Thai is done in less than 30 minutes! Easy Instant Pot Corn Chowder recipe is delicious and creamy. Delicious Instant Pot Gumbo is full of shrimp and sausage. Instant Pot Steamed Crab Legs is perfect for the seafood lovers in your family.